Romper: Eloise. Shoes: Jessica Buurman. Sunglasses: Karen Walker. Nails: OPI Gel A Good Man-Darin Is Hard to Find. Lip: Smashbox Electric Pink. Hair Tie (worn as a bracelet): Forever21. Bracelet: Overstock. This floral romper was in the pajama section at Anthropologie. I always check that area even when I am not in need of jammies because I’ve found other great day pieces there in the past. To me, this onesie is too pretty not to see the light of day, so I wore it while in Mexico on a birthday trip for my mom, who snapped these pics. 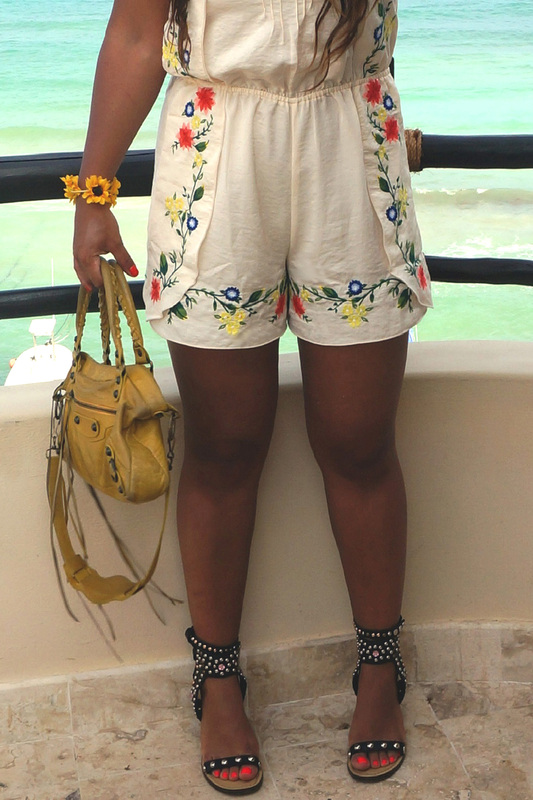 I couldn’t resist toughening up the cuteness of the romper with these studded sandals, which are a great alternative for those of us who missed the opportunity to snag a pair of Isabel Marant Elvis Sandals, or just don’t want to pay six times as much. Have you bought some some pj’s with the intent of wearing them as real clothes? Tell me. love the sandals!!! what did you think of the sizing? since there are no half sizes, just doing research of what would be the best fit.